Dual purpose color-coded pocket clip. Portability and easy ink identification in one! Durable pocket clip matches ink color, so you can choose the right shade in a flash. 1.0 mm medium point for strong, sure strokes. 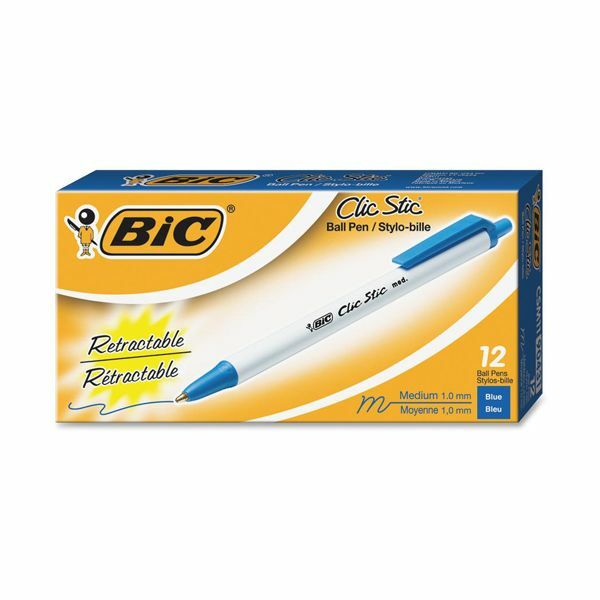 BIC Clic Stic Retractable Ballpoint Pen, Medium 1mm, Blue Ink, White Barrel, Dozen - Retractable ballpoint pens feature durable color-coded pocket clips and tip jackets to easily identify ink color. Retractable design means no lost or misplaced caps. Pocket clip is break-resistant for easy carrying and for storage when not in use. Design also features a round barrel, brass point and tungsten carbide ball. The writing is smooth and precise. 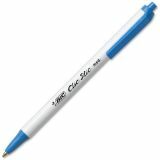 This BIC Clic Stic Retractable Ball Pen features blue ink and can be used for almost any purpose at home, school or in the office. 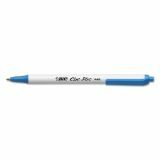 Retractable pens come with 1.0 mm points for clear, noticeable medium-sized lines. Ink won't dry up with retractable tip. Get the most out of your disposable pens! 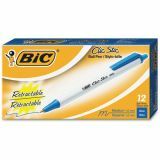 Retractable point keeps ink fresh and ready to use whenever you want. Round barrel offers smooth, glossy feel. The frictionless hold provides you with a smooth, non-irritating writing experience.